If there was one food I HAD to eat everyday for the rest of my life, without a doubt, it would be pepperoni pizza. I just never not want it. So in order to stay on track with my Weight Watchers Points Daily Allowance, I had to come up with a low calorie pizza recipe that was not only low in Points, but that also tasted close to what I might buy at a local pizzeria. Sure, there are tons of “healthy” frozen pizzas on the market, but they are loaded with sodium and preservatives, and just don’t satisfy my pepperoni pizza craving. 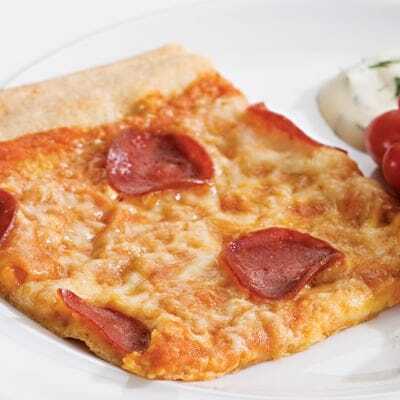 So by using a whole wheat crust, some reduced fat cheese, using turkey pepperoni, and by mixing some butternut squash puree in with the pizza sauce, I was able to lower the calories and fat, and increase the fiber content. The end result was a slice of pepperoni pizza for just 6 Points. It may not be Papa John’s, but it tastes fantastic, and it’s a much healthier and low Points way to get my pepperoni pizza on! If you love pepperoni pizza as much as I do, then you’ll be sure to appreciate this healthy pizza recipe that packs in a lot of good for you ingredients and still maintains the all the fabulous flavor of traditional pepperoni pizza recipes. Each nicely sized slice is just 6 Points, which is a great bargain compared to alternatives. Let the kids help you make this, and you’ve got a healthy family recipe that everyone will enjoy and will keep you on track with your Weight Watchers Points allowance. Preheat oven to 450°F and set oven rack to lowest setting. Spray a large baking sheet with non-fat cooking spray. Roll out dough on a lightly floured surface to the size of the baking sheet. Transfer to the baking sheet. Bake until puffed and lightly crisped on the bottom, 8 to 10 minutes. Mix butternut squash puree and pizza sauce in a small bowl until combined. Spread sauce evenly over the baked crust. Top with mozzarella, Parmesan, and pepperoni. Bake until the crust is crispy on the edges and the cheeses have melted, about 12 minutes. I made this pizza tonight and it was really delicious. I wanted to say thank you so much for your wonderful blog, I’m so excited to have found it! I’ve tried three of your recipes this week – this pizza, the middle eastern turkey kebabs with cucumber yogurt dip and spaghetti squash and sausage bake. They’ve all been really yummy and great for someone who is counting calories. My husband and I made this tonight. I have been doing WW for 2 months now and I always get so discouraged when I see recipes that swap delicious, unhealthy food for well, a lot less appealing but heathy food (example would be swapping a beef patty for a portabello mushroom cap). We figured we would give this a try and not only was it extremely easy (we even pureed our own squash) but it actually tasted REALLY good and next time I am thinking about using more squash. Definitely will be made again in our house! Husband said, “That was delicious!” We used this pizza crust: http://allrecipes.com/recipe/exquisite-pizza-sauce/ Next time I will be more prepared and make my own squash. We used frozen and should have used an immersion blender in the sauce. We also added one cup of canned pineapple (in 100% juice). This is my new go to recipe site.